Lagos has 22 million population with 3.8m Lagos households earning more than $5,000 per annum. Lagos has 3.9 million households that earn more than US$5,000 or N1.83 million per annum, according to a report by the Economist Intelligence Unit (EIU). This comes to an average of N152,500 a month. The number of households that earn above $5,000 per annum is projected to rise by 96.4 percent to 6.9 million in 2030. Around one-third of 3.8m household in Lagos represent roughly the upper and upper-middle household income of about 1.2m household, the latter ( remaining 2.6m population) are mostly resided on the Lagos Mainland Market mainly within central locations that have close proximity to link roads and bridges leading to other locations particularly the Central Business District (CBD) of Ikeja GRA, Maryland, Anthony Village, Ilupeju Gbagada, Ogudu GRA, Magodo GRA, Omole, Yaba, Surulere while the former are resided in Ikoyi, Victoria Island/Lekki Phase 1 respectively. These household segments have the interest and purchasing power that is required to acquire both upscale and medium-priced real estates. Generally, asking rents for 3bedroom multiple family units on the Mainland ranges between N 1,200,000.00 and above while on the Island its ranges between a 1.8m, 10m and above per annum, according RAC Nigeria. Defining Household Income today, comes with a lot of disparities and school of thought as revealed in a number of report from the renaissance capital/TNS, Africa Development Bank and Economic Intelligence Unit. Social strata that exists in Nigeria has its own peculiarity for instance some quarters have classified middle income class as those that earns average monthly income of NGN75,000-100,000 ($480- 645, or roughly $6,000-7,000 pa) while others put it 152,000 and above. Upper & Upper-Middle Household Income are the most heterogeneous as compared with Middle & Lower class, Upper/Middle includes entrepreneurs of different class like the Small but growing businesses SBGB owners, Senior Managers & E-Class Executives, Directors/Founders, top politicians and heads of MDA’s. 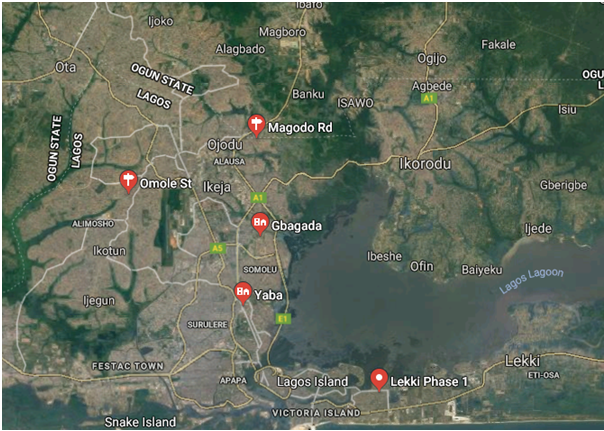 Arguably Nigeria boasts of over 50 blue-chip firms operating in Lagos. These set of firms operate a globally competitive payroll, middle managers take-home ranges between N500,000 and N1.2m. The combination of these blue-chip firms employs at least 35% of (the 1.2m population that belongs to the upper & upper-middle household numbers that form part of the 3.8m household in Lagos) a workforce population that works daily in Lagos, which is put at over 420,000 workforces. The remaining population in this bracket 75% of (1.2m) people falls either within a self-employment, entrepreneur. Small but growing business owners, captain of industries/serial entrepreneur, facilities & equipment vendors, Suppliers/Import & Exporters at different bulk market like Alaba Int’l, Int’l Trade Fair, Ladipo Market etc, independent oil & gas marketers, Independent building contractors & Real Estate Expert, Architect and Engineers, Industrial Farmers, Manufacturers or Craftsman and woman that makes a least of N10m total revenue quarterly. 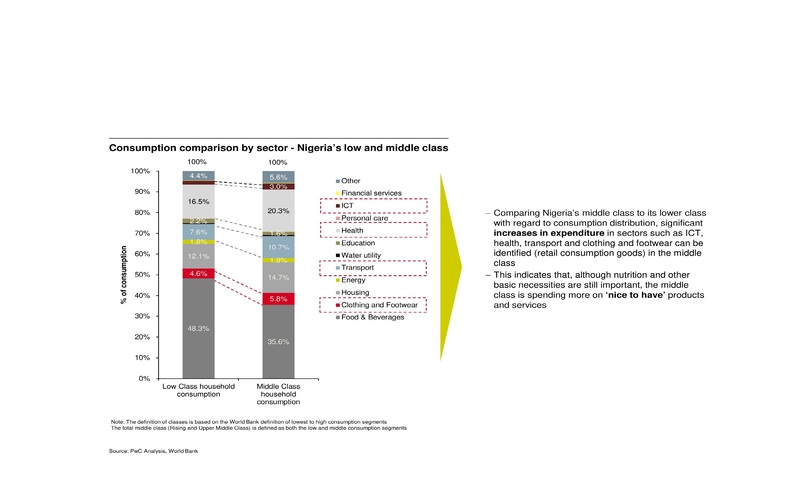 Other narrative that can reflect the household distribution in Nigeria is the shopping pattern and disposal income, the likes internet service and/or cable TV access. Cable TV, Car model & class, Social Affinity and Spending/Investment Orientation are all differentiators. There is a strong relationship between Household income and Internet & Cable TV access level, in Nigeria, DSTV has the largest market share in the Pay TV space with subscription ranging from N1000, 5400, 1600, 4000, 6800 up to N15,800, meanwhile the premium bouquet of 15,800 a month, is a bouquet mostly subscribed by the upper household income and a share of the upper-middle household, these population are resided within Ikoyi, Lekki phase 1, Omole, Gbagada, Magodo, Yaba, Surulere and GRA Ikeja, including Northern part of the country in Abuja, Kaduna and Kano. This is an indication that there is a high number of Upper and upper middle house income that resides in these areas. Consumer pattern in figure 1 below revealed how the Middle House Income spend their disposal income on healthcare, ICT, Education, Water Utility, Transport, Clothing & Footwear, Food & Beverage, ICT, Clothing & Footwear, Health, Personal Care, Transport, Financial Service, Education, Energy, Others and Housing. Housing is third after Food & Beverage and Health at 14.7%, 35.6% and 20.3% respectively. Thus, real estate/housing is taking a large churn of the household income within upper and middle-income household annual spending and plans. A high number of upper middle household live in leased/rented accommodation (68%) with an average household size of 3.7 people. The average number of children in each household is 1.6 (excluding those away at school) vs a national average that is closer to 3; larger families are more common in rural areas. Nearly half of the upper-middle have no immediate plan to move to a new house, 18% are planning to move to a newly completed self-owned apartment, others have desire to own a house or property but do not have plans or don’t really have know-how to go about this and those who have seen or heard about a number of real estate plans have not yet made a final buying decision. The average number of cars per upper-middle-class household is 1.9 (around one third of upper-middle-class Nigerians have a car that is less than five years old); 60% upper-middle of homes have two cars. Car ownership remains a social symbol and prestige, among this class. Nigerian Upper household invest largely in estates/assets, Oil & Gas, Equity/Share/Bond, Manufacturing, International Trading and/with future re-investment plans while the upper-middle class have a good saving culture, they care little about the deposit rate and don’t expects to borrow from a bank. If they had the funds, they would rather invest in land/or completed property than shares or bonds. Most do not have mortgages (which represent approximately 1% of GDP) or credit cards, though many expect to apply for the latter. Strategic marketing and positioning of real estate investment that is targeted at the upper and upper-middle household in Lagos, requires both online & offline location-marketing effort. This would eliminate waste in circulation and afford accurate visibility for prospective brands proactively. E.g a Facebook, twitter, Search Engine and Truecaller ads should be narrowed into all aforementioned location where this household are concentrated. In 2017, only 26% of people used the services of a real estate agent. This year, the number will reduce further because of the growing (number of digital native young successful captains of industries, senior executives with top blue-chip firms and entrepreneur) population. They are tech savvy, urban and conduct their own research before making a rent or real estate investment decision. Social affinity and extra-curricular places, that falls in these locations can also afford networking or where need be destination/hotspot co-branding for prospective realty brands. This are places people in this upper-class bracket as descried above, have good footfall and are frequently visiting with their friends and family at their leisure time. E.g. Strategic fuelling station or Hospitality place. This household class are frequent users of mobile taxes such as Uber, Taxify & OgaTaxi etc within and out of the locations mentioned above, during the 5 working days and weekends, an alliance that affords an experiential marketing with this modern taxi operator can be a sales Growth trajectory. Ad agencies designing the copies and motion pictures for realty products in this segment may need be sure of the most effective channel and social language to use by looking deeper into the above insights and understanding the pain points and concerns of this segment, and their behavioural patterns continuously to keep building the brand that whets their appetite. This segment of household are well learned people and rarely make impulse decisions on real estates, rather an informed or referral and thought led decisions. Videos that depicts past similar projects success, testimony and learning or cases videos that lead a prospect to take-action, can also deliver an effective marketing and sales Growth using the Big 3 digital channels for realty brands (FB, LinkedIn and YouTube). Organization of Seminars or attending high-level seminars in town, seminars and corporate event are usual spot, where this Household segments find themselves attending this kind of gathering at least once or twice in a quarter. This serves as a Consumer Touch point for realty brand to network and touch prospects with their products and promises, the population that fall into this space have strong believe for Seminars and workshop, so there is high possibility of closing deals and networking further at this venue. E-mail newsletter is a powerful instrument to establish and maintain a long-term relationship with this type of audience. To achieve this, one need to collect emails from website visits and also genuine corporate email vendors or strategic partner, although one need ensure what is been send falls into their concerns/pain point not just direct marketing designs or contents. Like sending them information on a new property on the market and tips that help them make better decisions.